After years of following this amazing event via tweets from my Twitter PLN, I was finally able to attend in person – what an amazing experience! Since I took part in the pre-conference for librarians with Debbie Abilock as well, I got three days of exciting and motivating learning experience through keynotes, panel discussions, workshops and unconference sessions. I listened to and was engaged in presentations on how technology has the potential - when used in the right way - to extend and redefine learning for our students. Here are some of my thoughts and some of the resources I took away from this. Kids love the easy-way out when looking for information, making Google and Wikipedia their preferred one-stop. It is important to teach students how to evaluate resources. Students need to learn to cite sources manually, thereby the focus not being on the commas and the periods but rather the understanding of the pieces of information that go into a citation and where to find them. ThingLink is a great web tool for annotating pictures, which can then become a powerful resource for a provocation at the beginning of an inquiry or for introducing/teaching students about the concept of “tagging”. Here an amazing list of links to Image Sources. Noodle Tool offers some free resources for evaluating and citing sources: Show Me Information Literacy Modules. Individual pages can easily be embedded in websites. I found especially the pages that show students where to find what piece of bibliographic information very useful. WolframAlpha – a totally intriguing computational knowledge engine – I could imagne that this is another great resource to get an inquiry started. (You can find all of my notes in this public Google Document). There was lots of talk about Google searches and Wikipedia. Listening to the comments and remarks of the presenter as well as the other participants made me wonder whether my practice was the right one. 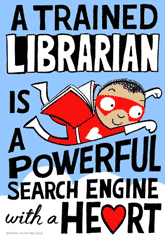 I encourage/ expect our Primary School students to follow a sequence of search strategies, beginning with World Book Online, then moving on to the library’s online catalog (we use Follett’s Destiny - Library search for books and WebPath Express for websites), then go to online subject directories such as KidsClick – and only if students still haven’t found enough information at this point will they go to a kid-friendly search engine such as KidRex. I have thought about this quite a bit since the conference and while there is much value in the points made, I am not convinced that introducing these skills in Primary School would help my students. I agree that it is important to teach students how to use Google and Wikipedia efficiently and appropriately, but at a later stage, let’s say in Middle School. I think it otherwise overwhelms kids who have no or little experience with any kind of search engines or databases. Let them practice skills such as identifying keywords and making searches in an online catalog first. Not only will they will find it much easier to learn how to apply and build on these skills when learning to conduct efficient searches on Google but it also enables them to be successful in locating and using information with little or no assistance early on. When talking about this with my students, I compare searching the Internet with learning how to drive a car: no one starts on the super highway, we all start on smaller roads and as our confidence and skills increase, we try out bigger roads. Kids need an audience relevant to them for what they create. Creating a global audience is a motivator for their work. The question is how we can begin to give credit for what kids do outside of school. We need to enable kids to have learning opportunities in all spaces (school, after school, community, home) they spend their time in. Does digital media take away from traditional literacy? Dr. Pinkard says no, it enforces traditional literacies! What does it mean to be literate? It's not just about reading and writing anymore. Kids have to be able to communicate in multiple ways. Participation gap: those who can create with media vs those who only consume. Kids have access to the technology but unequal access to opportunities to the learning on how to use them efficiently. An environment can be created that makes up for the participation gap, e.g. libraries as spaces where students create! Libraries are turning into exciting learning hubs with mobile learning devices (I love this!). Students need to consciously critique the media they consume before they create their own. Check out Dr. Nichole Pinkard’s project website. Don't turn your iPad into an expensive notepad when using it in your classroom. An iPad is not a computer but a mobile device. It has lots of other (additional) functions and should not be considered as a replacement. Mobile learning is changing the space in which we are learning: pedagogical space, virtual space & physical space. Mobile devices allow your students to take the teacher home. Mobile devices allow you to take your classroom into the world. Check out Dr. Jenny Lane’s blog. The most important thing I learned, even before going into the extended special session on alternatives to the iPad is that there is no alternative, at least not in my opinion and not for my situation. None of the other tablets the panel speakers introduced offer such a wide range of applications that allow technology to redefine the learning and not just substitute the tools of traditional teaching and learning strategies. An iPad is not meant to replace a desktop computer or Macbook but rather provide additional and new opportunities for teaching and learning. I loved how John Burns in his presentation introduced and provided demonstrations of apps, categorized according to the level of transformation they provide (i.e. from substitution, augmentation, modification to redefinition). The aim is here to get away from merely substituting traditional tools with technology but rather reach redefinition of the learning through the use of technology: Check out all the fantastic apps he introduced here. The session also addressed important issues about the implementation and management of the devices within a school: iPads need to get into the hands of teachers first – the key element to a successful implementation; and iPads are best managed in smaller numbers, not more than 5 devices attached to one account. It’s all about assessment when using the iPad in literacy instruction: assessment by teacher, peers and self. Big plus of using iPads in readers & writers workshop: it motivates students – and helps teachers with the process of recording and assessing student learning. Confer app is an amazing resource for the teacher to use during reader’s and writer’s workshop. It takes some time setting up but once it's all in place, what a great tool to keep track of students' progress! Recommended reading and a good starting point on how to make use of technology in literacy instruction even though published in 2009: Troy Hick’s The Digital Writing Workshop. This post is becoming longer and longer and I feel I need to come to an end even though I still haven’t covered all, like the interesting sessions on teachers as lifelong learners, the opening keynote on how technology affects the brain, the session on funky ways of teaching kids about copyright, the unconference session on making thinking visible, the inspiring and highly entertaining closing keynote by D.D. Meyer and the many great resources shared (have a look at my Diigo for more). I guess it will still take me a long time to really process everything that I heard and learned. It was of course also fabulous meeting so many of my Twitter friends for the first time in person! Last but not least, check out Dianne MacKenzie’s reflections from the conference. She has done an amazing job in writing down her thoughts and in compiling the best resources shared.